Infinite Art Tournament: Element of the Month: Boron! I was all excited to talk about how Boron is one of the only elements that you can buy at your local supermarket, and also about Death Valley and mule teams and all that business, but it turns out I was confusing Boron with borax. That wasn’t crazy of me, as both are five-letter words that start with “bor.” Moreover, borax is a compound of boron and sodium. But, as we students of chemistry know, once you mix an element with other elements, it’s just not the same anymore. Not only can you not find pure Boron in the supermarket, you can't even find it in all of nature, and it’s apparently pretty damn difficult to isolate in the lab. 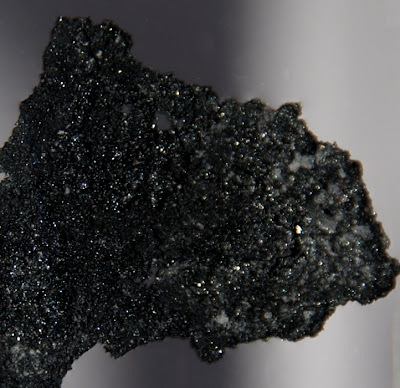 The guys who determined that it was an element in 1808 and 1809 were only able to produce about “50% pure” Boron, whatever that means, and a way of really isolating the stuff wasn’t hammered out until several years into the 20th Century. Also, although you always expect the elements with the little tiny elemental numbers to be common as dirt, Boron is actually quite rare. The Mohave Desert and Death Valley deposits and some areas in Turkey are about the only places to find Boron compounds in volume. So getting the pure stuff at the supermarket? Not going to happen. The main traditional use of Boron is in the manufacture of such products as – ha! If you were paying attention, you realize that there can’t be a traditional use of Boron. Gold star to you. The rest of you: Remember, pure Boron doesn’t appear in nature! Hang your heads in shame. The primary traditional use of Boron compounds is in the laundry, where they are an ingredient in various formulas of detergent and bleach. They’re also used for ceramic glazes, fiberglass insulation, and “Borosilicate glass,” which is Pyrex to you and me. Newfangled uses have come along, of course, and various Boron compounds are used in micromachinery, in bulletproof vests, in a plethora of industrial processes (of course), and as a dodgy but common food additive in a number of Southeast Asian countries. Boric acid has been in the news recently for its neutron-capturing tendencies; if you’ve got exposed radioactive material on your hands, you can do worse than to get some Boron on it. Hopefully this won't be an issue for you. Boric acid is also used as a poison to kill roaches, ants, termites, and other insects. You can buy it as a powder, as an ingredient in many insecticides, or in "roach tablets" (and they even use it in the "Roach Motels" - which have always quite frankly creeped me out, but that's another issue.) Insects like the taste of it, but it's apparently not so good for them. It is non-toxic for humans, as long as you aren't eating piles of it. Hey, I actually know something on this subject (thanks to my mother)! Evidently, not all of the Pyrex makers (even the name-brand stuff) still use boron, and people complain that it's no longer as durable and resistant to temperature changes. I'm not fooled. You went out and got a chunk of asphalt from one of the winter potholes. i never thought about boron being the base of borosilicate. awesome. I new about the borosilicate, but it never occurred to me that Borax would have anything to do with boron. I think I'll buy Borax with more interest now. If they even sell it in Canada. Oops. Maybe this link will work for "The Boron Song"
Anonymous: I hereby grant the extra credit. Thanks for the Boron info that was definitely not Boring! See, you already said that once.